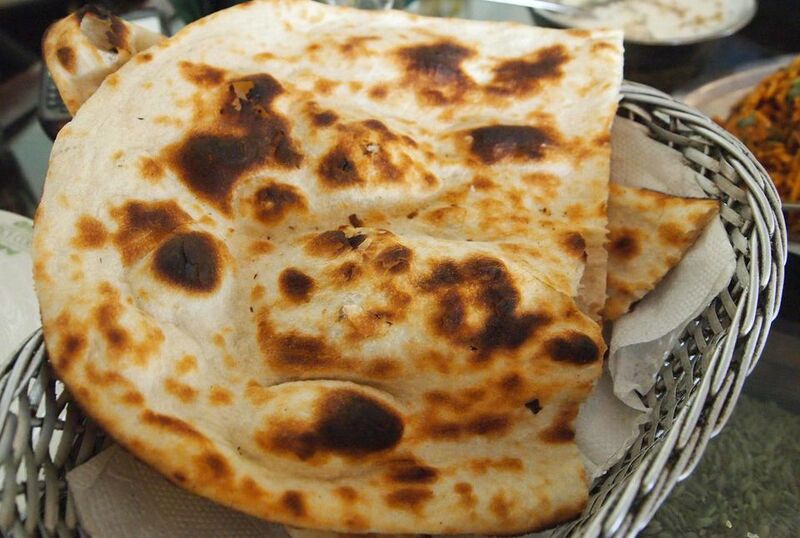 Naan is like pita, yet softer and most of the time larger. It can be frozen in freezer bags for up to 30 days. You will love how easy this naan recipe is to make at home! Measure 3/4 cups warm water in a measuring cup. Allow yeast to soften and stir until yeast is dissolved. Cover measuring cup with towel and allow yeast and water to froth for 5-10 minutes. In a medium mixing bowl, combine flour and salt. Add yeast water, yogurt, and ghee (or vegetable shortening) and begin to knead for 5-10 minutes until a dough forms. Place dough in bowl coated with oil and turn dough around to evenly coat. Cover bowl with towel and allow to rise in a warm area for about 1 hour or until the dough has doubled. Preheat oven to 400. Divide dough into 10-12 pieces and roll out on floured surface into circles. Place rolled out dough on greased cookie sheet or baking stone and brush with melted butter. Cook in oven for 8 minutes or until lightly browned and puffed up. Serve naan immediately or store in pantry or freezer.